The Law Offices of Magdalena Kochanski is located in Concord, California in the Contra Costa Family Justice Center. Magdalena serves the East Bay community with passion and professionalism. She strives to provide excellent legal services, helping families with Immigration and Family Law matters. ​She believes the most rewarding aspect of being a lawyer is bringing a positive change to her clients’ lives. Magdalena is focused on finding creative solutions that help parties achieve a compromise and accommodate their goals. Her practice encompasses all aspects of the family; especially the well being of the children involved. 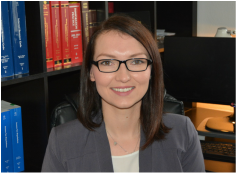 Magdalena graduated from the University of Warsaw Law and Administration with a Masters in Law degree. She went on to complete her LLM in Comparative Law at Levin College of Law at the University of Florida. She is licensed to practice law in New York and California. She is a native Polish speaker and also communicates in Slovakian and Czech. Magdalena has been practicing Immigration Law in the Bay Area for over 10 years. She frequently works with Bay Area Legal Aid and the Family Justice Center helping clients with Family Law and Immigration Law related issues including but not limited to: Domestic Violence, Restraining Orders, Custody, Child and Spousal Support, Divorce and Separation, Immigrant and Nonimmigrant Visas, Permanent Residence and Naturalization applications. Release Date: Aug. 28, 2017WASHINGTON – U.S. Citizenship and Immigration Services (USCIS) will begin expanding in-person interviews for certain immigration benefit applicants whose benefit, if granted, would allow them to permanently reside in the United States. This change complies with Executive Order 13780, “Protecting the Nation From Foreign Terrorist Entry Into the United States,” and is part of the agency’s comprehensive strategy to further improve the detection and prevention of fraud and further enhance the integrity of the immigration system. USCIS Suspends Final Adjudication of Employment-Based Adjustment Applications for the Remainder of FY 2015Starting today, USCIS will suspend final adjudication of employment-based Form I-485 applications (Form I-485, Application to Register Permanent Residence or Adjust Status) because the Department of State reports that the statutory cap has been reached for the employment-based preference categories for fiscal year (FY) 2015. This suspension applies to all employment-based adjustment applications pending with USCIS through September 30, 2015 (the remainder of FY2015). USCIS will continue to accept adjustment of status applications that are filed when the foreign national’s priority date is earlier than the cut-off date published in the September Visa Bulletin for his or her preference category and country of birth/chargeability. USCIS will resume final adjudication of employment-based adjustment applications beginning October 1, 2015, when visa numbers are again available. Applicants filing Form I-485 on or after October 1, 2015, should review the “When to File” section on the Visa Bulletin Info Web page to determine whether they are eligible to file Form I-485.